The web page from the collection project that is used to present the collection themes has been updated to maintain the progression of the project. I have added a third row, Collections in the Collecting Process, to this web page. This row separates the themes that I am still actively collecting. The bottom row, Collections in Their Entirety, presents the Coupon Collection that was just placed on hold and three other themes that I consider inactive in the current collecting process. This reorganization of presenting the collection themes demonstrates the projects growth with the beginning themes and a short-term project as well as the use of the Internet capabilities to understand and maintain the altering stages of employing digital media. 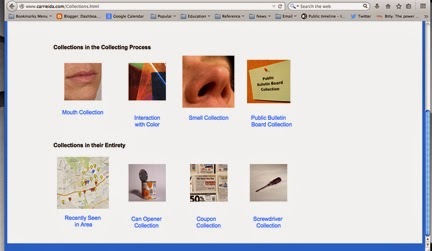 Included is a couple of screenshots of the current web page as another visual method of archiving the progression of the Internet-based project. Approximately three years ago, I began my Coupon Collection by buying a local Sunday Newspaper. Today, I intentionally stopped the coupon collecting process and placed the collection on hold. This is not because print media coupons no longer exist, but rather a decision based on my time to further pursue my current research in visual methods using digital media for the Internet-based collection. 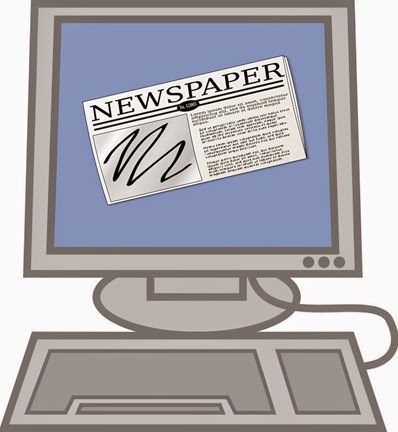 The investigation with the Coupon Collection concerned the shift from a tangible object (print media coupon) to an intangible discount saved on a digital device. A future September 2014 blog post will present a short summary of my coupon collecting process, along with the current state of my local communities print and digital media culture. The tally for August 2014 segment of the Coupon Collection is 1192 and the other preceding months tallies can be viewed on the Coupon Collection’s webpage. My Spring 2012 essay The Print Media Coupon as Artifact is also available on the Coupon Collection’s webpage. I referenced this essay to give my illustrated talk last year at the Impact8 International Printmaking Conference at the University of Dundee in Scotland. http://carrieidaedinger.blogspot.com/2011/11/coupon-collection.html [Accessed: November 26, 2011].